The Vakil mosque (the Regent Mosque) has an impressive portal containing faience panels in floral designs with various shades and colors on each side. The northern iwan (verandah) is decorated with shrubs and flowers mainly rose bushes. 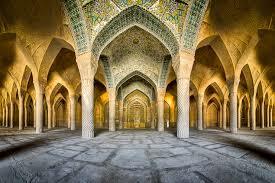 The ceiling in Mihrab Chamber (altar) is covered with small cupolas resting on twisted columns. Vakil Bazaar, which is close by, was built by Karim Khan Zand. Here silversmiths and jewelers still apply their trades of exquisite inlay work. Persian carpets and other traditional Persian handicrafts.